"Louw’s brilliant script focuses on the personality of Stella (Goldschlag) as a whole. On the one hand there is the attempt at self-justification . . . on the other hand we are confronted with a woman who is still overwhelmingly preoccupied with her looks, her sexual conquests, her loneliness, and her own suffering." "It’s a spell-binding, uncomfortable 90 minutes of entertainment. Uncomfortable in the best possible way." "This is a fascinating performance of a well-written, intriguing play." "Gail Louw has written, without doubt, one of the finest pieces of solo theatre ever to have been performed with her latest play, Blonde Poison." "Overall this is a superb, thought-provoking, solo performance from an actress who is the most amazing storyteller." "I wanted to thank you for the performance of Gail Louw’s ‘Blonde Poison’ which featured as part of Windsor Festival . . . I have been impressed by the reactions, both those with whom I spoke on the night and those since – everyone expressed how the performance captivated them . . . Elizabeth was astounding, but the material was also expertly crafted, as was the set, lighting and sound design. A perfect piece of theatre. I hope your tour continues to engage audiences throughout the country." This is a play that grabs your attention from the start and doesn’t let you go until the final curtain. It is a brilliant piece of work from writer Gail Louw . . . and a stunning performance from Elizabeth Counsell." A "spellbinding story of hideous betrayal". "Without question, Blonde Poison is the best piece of theatre I have seen at the Fringe this year, and quite possibly one of the most earth-shatteringly good performances I have ever seen from any actress." "Stella is one of the most three-dimensional characters I have ever seen on the stage." "This is an intensely intellectually stimulating piece of theatre which forces the audience to ask questions about humanity." "I cannot recommend Blonde Poison enough." painful it made several around me gasp." "Gail Louw’s brilliant script feels natural." "It’s a stark gem – designed to both shock and linger." "Powerful and thought provoking… incredible and intense… deeply shocking … an unforgettable evening." "a remarkable performance… spell blinding …. Holds the audience in thrall." "This is a story that must be told … marvellously written and wonderfully performed." 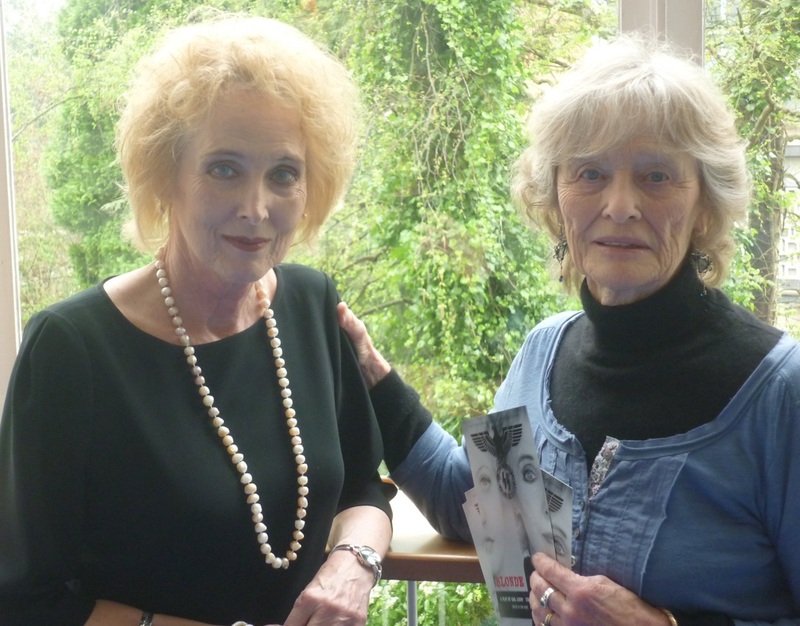 BAFTA Award winning actress Virginia McKenna OBE and star of films including; Born Free, A Town Like Alice and the acclaimed Carve Her Name With Pride, in which Virginia starred as a female Special Operations Executive who went behind enemy lines in Nazi occupied France, attended a performance of Blonde Poison at Jermyn Street Theatre earlier this year. Enamoured with the production, which stars Elizabeth Counsell and is directed by Tony Milner, Virginia is keen to share her passion for this fascinating piece of theatre as the show embarks on a national tour. ‘’For almost an hour and a half no one moved or coughed or fidgeted. I cannot recall ever having a similar experience as a member of a theatre audience. It was one actress, Elizabeth Counsell, alone on stage as Stella Goldschlag. The‘Blonde Poison’. Bringing to us the dark and true story of a German Jewess in Nazi Germany, a victim but also a cruel betrayer. A tough story to tell, but the combined skills of the author, Gail Louw, and the actress, brilliantly allowed us moments of understanding. I cannot think this work would find a better interpreter than‘Elizabeth Counsell – she was superb. But then, she did have a marvellous script’’. Written by Gail Louw, the play is based on the true story of Jewish woman Stella Goldschlag who betrayed as many as 3,000 fellow Jews during World War ll. The play follows Stella, a truly complex character, as we piece together her journey and the role she embraced working for the Gestapo in war-torn Berlin. "This was an incredible and intense portrayal of a woman the audience grew to simultaneously loathe and sympathise with. Nervously awaiting the arrival of the journalist to interview her, Stella Goldschlag started imagining the questions he would ask, and remembered her life as a young woman in Berlin during the Second World War, and the series of events that led her to working for the Gestapo. Nicknamed Blonde Poison, she was convicted of informing on more than 3,000 Jews. What would lead a Jewish woman to do this? Gail Louw’s play, based on fact, skilfully portrayed a hugely complex character, which Elizabeth Counsell delivered with an impeccable, powerful yet sensitive performance. The audience was taken on the journey, laughing with her at her foibles, smiling at her pride in her white smile, and suffering with her torture from the Nazis. It was uncomfortable yet gripping, including watching her talk with distaste about the Jewish people. She was so proud of how beautiful she looked: blonde, blue-eyed and, she said, non-Jewish. This was a deeply shocking and thought-provoking play, raising many questions about the lengths people will go to for survival, and how they justify that to themselves. She was brought up to think of herself as better than others, and it was clear there were some things she enjoyed about her work for the Gestapo. But was this evil within her or was it a means of survival? This was an unforgettable evening, which will no doubt haunt many who were there." "Blonde Poison: if the name doesn’t captivate you, then the performance certainly will. From the moment I arrived, I focused on nothing else. The [true] subject matter is a beautiful yet deadly heroine, Stella Kuebler-Goldschlag, who gave the lives of her fellow Jews in return for her own and her parents’ safety and the trappings of Nazi comfort. While the data varies, she was said to have ‘caught’ anywhere up to 3,000 victims during WWII. Stella was intelligently portrayed by Elizabeth Counsell, who gave an engaging interpretation of Gail Louw’s clever script. The stage was simply set with Counsell’s stark blonde profile almost glowing against the dark cold set of Stella’s furnished flat. Counsell’s remarkable 90-minute monologue, conveyed the mixed bag of character traits that were wrapped up inside this woman. She laid out the case before us, pulling us into her confidence while simultaneously pushing us away with her arrogance and provoking our revulsion at what she had done. Despite all this, there were incongruous moments of humour that almost caught you off balance. scheduled for another performance at the Jermyn Street Theatre in March 2012 and there is a UK tour in the planning." “We are never free of the Holocaust. People will still be talking about it in 400 years, rather as we in Britain still talk of the Wars of the Roses and Americans about the Civil War. At Jermyn St, and now on tour throughout the UK, is Blonde Poison, the true story of a Jewish woman in war-torn Berlin who, to save herself from Auschwitz, agreed to betray other Jews to the Nazis.